Many Strathcona classes were fortunate to meet Tundra, a female wolf, yesterday afternoon. Her handler Gary left us not only great memories of meeting such an incredible creature, but also a signed book. Filled with beautiful photographs, The Sea Wolves: Living Wild in the Great Bear Rainforest, is a stunning book filled with a lot of information about these unique wolves living on BC’s coast. Check out some video of these wolves taken by Pacific Wild. Contact Gary Allan for more information about his school program. Adult horror author Neil Gaiman has written some fantastic (and scary) children’s books, the most well known is probably Coraline, made into a film version by Tim Burton. In this picture book, filled with creepy images, Lucy is convinced wolves live in her walls. She tries to discuss this fear with her mother, father, and brother, but no one, except her little pink pig puppet believe her. Until one day… the wolves come out of the walls! The family flees, but in the confusion and hurry, the pig puppet is left behind. What will happen? Where will they live? Is Lucy brave enough to return? 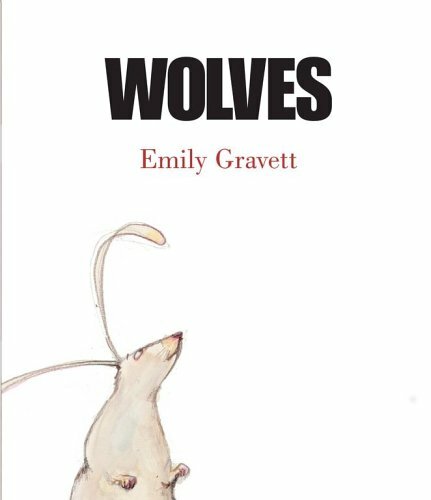 This is a beautifully (and creepily) illustrated picture book by Emily Gravett, one of those amazing authors AND illustrators. Recommended by my friend and colleague Carrie Gelson, this book is a great read aloud. the wolves become more and more real… what will happen to our friend rabbit? And The True Story of the Three Little Pigs, a fractured fairy tale told from the wolf’s point of view. Very funny and I always love Lane Smith’s illustrations.